The shoulder joint has the greatest mobility of any joint in the body. 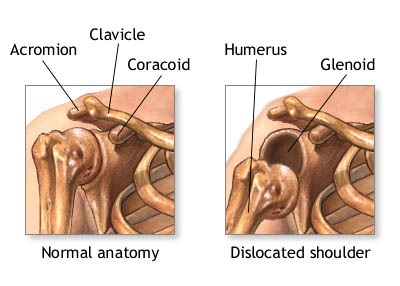 Due to this, it is also the most frequently dislocated joint.Instability of the shoulder joint may be a result of a frank dislocation from a traumatic event or slow and progressive instability from continuous trauma. Shoulder instability can range from subluxations – partial shoulder dislocations where the joint does not come completely out of the socket – to true shoulder dislocations, where the joint comes apart completely and remains in the dislocated position until it is reduced, or put back in joint. Elite swimmers and gymnasts all have lax shoulder joints that allow them to have a large range of motion, and when examined their shoulders can be shown to be loose These shoulders however, are not considered unstable in that they do not come out of joint and stay out, nor do they hurt if they come partly out of joint (sublux). The surgery can be done arthroscopically or using an open approach. The selection of the technique for surgery depends on the type of pathology or injury involved. The surgery is usually done arthroscopically.